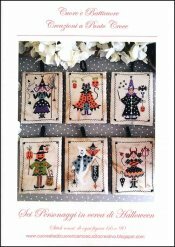 Sei Personaggi In Cerca Di Halloween [C8903] - $13.44 : Yarn Tree, Your wholesale source for cross stitch supplies. Cross stitch pattern by Cuore e Batticuore. This Halloween pattern features 6 different designs. A few of the patterns are a witch with her broom, a cat with pumpkins, a pumpkin carrying a trick or treat bag & a ghost with an owl, holding a BOO sign, etc. Stitch count 66 x 90. Stitched on #2235 Edinburgh Cream.